A major focus of our lab's research is investigating and facilitating the welfare of dogs kept in commercial breeding kennels. While the term, "commercial dog breeding", is often used synonymously with "puppy mills", they are not the same. We define a puppy mill as a dog breeding facility where profit is clearly given priority over the well-being of the dogs, and where there is no interest in or effort toward addressing welfare problems. This lack of consideration of dogs' welfare needs and interests often manifests in filthy and unsafe kennel conditions. Dogs are frequently dirty, ill or injured, and they may receive little to no veterinary care. Their home quarters may be cramped, crowded and lack opportunities for dogs to engage in behaviors of importance to them, such as socializing with others of their own kind, play, positive caretaker interactions, or exercise. Puppy mills (as defined here) are completely unethical. We do not support them, do not believe anyone should support them, and consequently, we do not work with such operations. 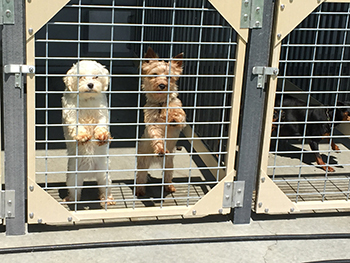 We study dogs kept at commercial breeding kennels. Licensed commercial breeders vary in the quality of life they offer to their dogs. However, they must at minimum be USDA inspected, and must comply with state and federal standards for dog care and well-being. These kennels may range in size from very small to very large (hundreds of dogs). Our overall aim is to understand the care and welfare practices used in licensed commercial breeding kennels of various scales of operation, investigate the implications for dog welfare, and determine which interventions potentially lead to optimal dog outcomes as a function of the quality of care the dogs receive. In the video clip where the dogs are in the arena with a caretaker, they have a high level of positive interaction with him. These dogs are clearly used to seeing and interacting with the caretaker and they appear to enjoy those interactions based on their behavior. In contrast, when the dogs are in the arena with a person with whom they are unfamiliar, their behavior changes drastically. They stay very far away from the stranger and look for a way out of the arena. One of the dogs begins to show repetitive behavior by running back and forth between the same spots while barking. This repetitive behavior indicates the dog is fearful. The differences in responses of dog to the caretaker vs. the unfamiliar person suggests that while they appear to have positive, frequent enough interactions with him to solicit his attention and continue to engage with him, they are not generalizing their perceptions of such interactions to strangers. This suggests that the dogs need more, gentle, effective socialization to different people to reduce fearfulness when in the presence of unfamiliar people. Commercial dog breeding, which helps to meet high public demand for purebred dogs, faces significant scrutiny and criticism relative to the health and well-being of the dogs and puppies produced. 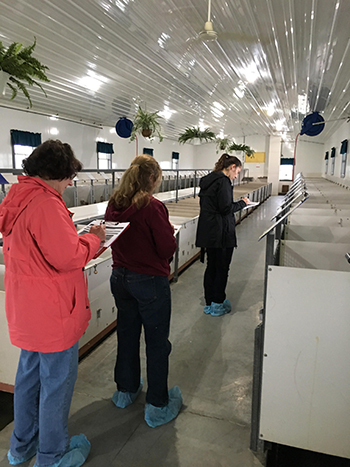 Regulated commercial breeding kennels often have difficulty distinguishing themselves from puppy mills, wherein profit is prioritized over the well-being of dogs. This project aims to help the US pet industries address the socio-ethical and scientific (well-being) concerns embedded in commercial dog breeding by developing and testing voluntary standards for the care and well-being of dogs in commercial breeding facilities that far exceed minimum (legislated) standards. 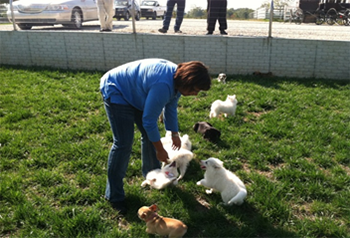 The Purdue Standards for breeding dog care and welfare have gone national! Animal Welfare Concepts: Applications to Dogs. Auditory Stress: Implications for Kenneled Dog Welfare. Promoting the Welfare of Kenneled Dogs: Environmental Considerations. Implications of Weaning Age for Dog Welfare. 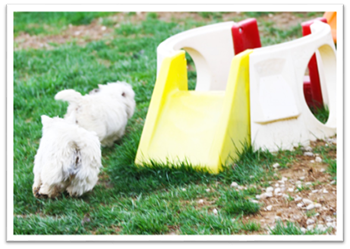 Promoting the Welfare of Kenneled Dogs: Space Allocations and Exercise. The aim of this study was to characterize the relationship between flooring types common in US breeding kennels and the physical health, body and kennel cleanliness of dogs housed on them. The results indicate that dog foot health and cleanliness can be maintained on the flooring substrates assessed. Dog comfort, behavior and preferences for flooring types require investigation. 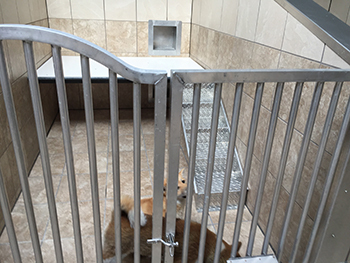 Does Flooring Substrate Impact Kennel and Dog Cleanliness in Commercial Breeding Facilities? The foot health of dogs housed on 3 types of flooring- diamond-shaped coated expanded metal (i.e. Tenderfoot), polypropylene, and concrete- were assessed. Few foot, elbow or hock problems were identified on any flooring type. 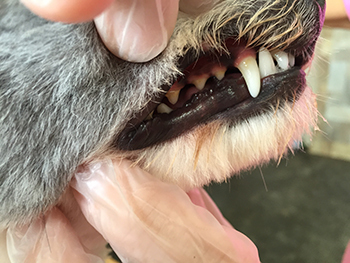 Periodontal disease, inflammation and breakdown of the structures that support the teeth, is one of the most commonly mentioned health concerns for dogs in commercial breeding facilities. However, to this point, no research has been performed to determine how common periodontal disease actually in within breeding facilities. This project has 2 goals: to determine what percentage of dogs in commercial breeding facilities have severe periodontal disease and to evaluate how well inspecting the teeth and gums of an awake can detect periodontal disease. Evaluating the validity of a visual dental scale for detection of periodontal disease in non-anesthetized dogs. A visual assessment tool for scoring dental disease in awake dogs was compared to the "Gold Standard" of examination under anesthesia with radiographs to determine its validity and reliability. Periodontal (dental) disease (PD) was visually scored using a 0-IV scale where 0 is no disease and IV is severe disease. Quick and accurate assessments of the health and welfare of kenneled dogs are essential for ensuring and promoting dog welfare. Because many welfare metrics exist and observers or inspectors may prioritize these differently, reliable, standardized measures of welfare may facilitateconsistent, objective evaluation of dogs. A non-invasive tool, incorporating behavior was developed and pilot-tested by experts and novices in animal behavior and welfare with dogs housed in commercial breeding facilities and at shelters. Developed a field assessment tool that allows for a rapid assessment of the health and welfare of kenneled dogs by individuals with limited training. Objective, science-based information is needed to establish best practices for transitioning dogs out of their breeding careers and to minimize risks of poor rehoming outcomes. This study aims to develop physical and behavioral well-being criteria for rehoming candidates, identify breeder practices that facilitate or make transitioning to rehoming risky, and develop a breeder education program emphasizing behavioral well-being, self-assessment and appropriate planning for all phases of a breeding dog's life with emphasis on preparing retired breeding dogs for success outside of the kennel environment. Assessed the behavior of dogs for risk of transition problems during rehoming using a 4-step stranger approach test. Based on the results of this test, 41.7% of the dogs assessed were at risk.